The Bombay Flying Club — the oldest in its league in the country — has been dubbed a “rank trespasser” by the Bombay High Court and asked to vacate the Juhu airport by April 24 or face forcible eviction, including police intervention. In an order passed two weeks ago but made available on Thursday, a division bench of Justices SC Dharmadhikari and Bharati Dangre said that the club had been unauthorisedly occupying close to 1 lakh sq ft of prime land at the airport since 1998 when its last agreement expired and was ineligible for any kind of relief. The court did not even spare the Airports Authority of India (AAI), saying that they allowed the club to function from the airport for two decades without any permission or contract in writing. “It is surprising that a person in wrongful use and occupation and a rank trespasser is entertained, encouraged and indulged by the officials and they faced no departmental or criminal action,” the bench observed. In response to the AAI’s assertion that it would initiate action against the club if it didn’t vacate the airport, the bench said, “We do not know of any such law and we do not think the Airports Authority of India now should initiate any eviction proceedings. It is the petitioner’s defence but based on their independent right in the property which has been demolished by us. It is the petitioner’s conduct which is wrongful, illegal and they are rank trespassers. We do not think, therefore, that any proceedings for their eviction should be initiated,” the bench observed. The bench, however, allowed AAI to pursue a case for recovery of its dues of over Rs 2.26 crore. This was based on a demand of rent of Rs 5 lakh per month from the flying club since 2007. The AAI said this rent was 10 per cent of the market rate. The Bombay Flying Club had filed the case, challenging the decision to evict it. One of the main legal arguments put forward by the club in the High Court was that it was a no-profit-no-loss entity and was training people even from Scheduled Caste and Scheduled Tribe communities. However, the court observed that, by its own admission, the club wasn’t receiving any grant from any of the governments. The AAI had submitted that the club was using the premises for commercial purpose and was charging heavy fees from the students. It called the club no less than a “commercial shop”. The Bombay Flying Club, established in 1928, is the oldest aviation institute in the country. The club’s first flying licence in the country was issued to its founder JRD Tata, already a trained pilot in France, in 1929. The first woman pilot Rabia Futehally obtained her flying license from the club as well. The club was started on what is now called the Juhu airport in the heart of the city. It shifted operations out of the city in 2009 owing to air traffic, but never vacated the airport premises. The club ran into trouble in 2011 after it was audited following a fake pilot scam. 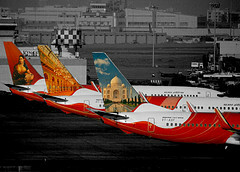 During this time, the DGCA had refused to renew its licence. However, the issue was resolved after the club expelled two of its senior executives. As per the court order, post-Independence, the original Indenture and/or rights granted to the club were extended from time to time. On March 10, 1997, the AAI further renewed its licence from January 1, 1997 to January 31, 1998 at a token fee of Rs 1/ per annum. After that, the club kept communicating with the authorities for an extension, which never came. Neither did the club vacate the airport.